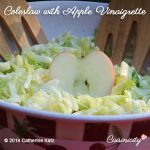 A simple nutrient-filled salad that brings the flavor of fresh crisp cabbage and tart green apple together brilliantly. The chopped walnuts give it the perfect final touch! It’s so satisfying! She asked as to the cider not the vinegar, after reading others post seems apple juice is fine as a substitute for cider. Does one use apple cider vinegar AND apple cider – is it the alcoholic apple cider?? Yesterday was really hot so we decided, why not have cole slaw with our chicken dinner! It was so easy to make, and really light and delicious. Perfect for a summer side dish. I love the apple taste, and the walnuts are a great addition that I never would have thought of. This will become a regular recipe for our summer repertoire. Let me just say for the record. 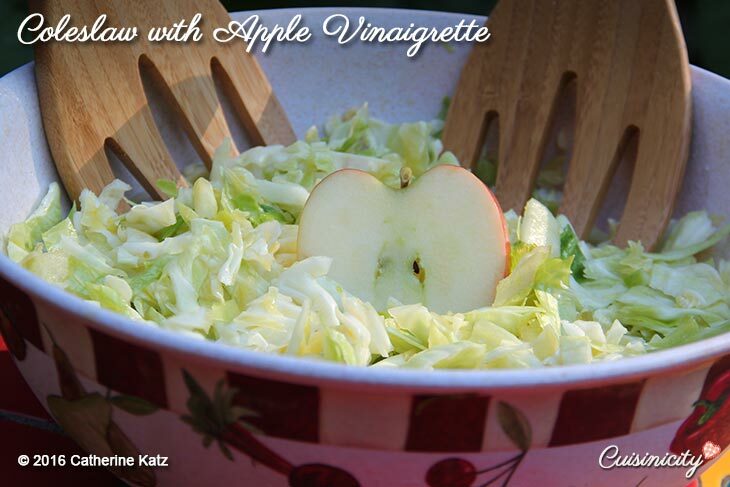 The Apple Vinaigrette is awesome !! I have not tried this recipe yet but I will! I use apple cider vinegar all the time, but not apple cider. The recipe calls for both. I never buy apple cider. What would be a good substitute? Could I juice an Apple? May I ask why, Lillian?? It’s readily available at any supermarket, it is not any more expensive than any other vinegar and its flavor is just right for this recipe, which is why I picked it! I suppose you could use white wine vinegar in its place. Additional apple juice would not work as well (note that I already use apple cider as well) because it needs a little acidity, which is just right in the apple cider vinegar.